A permanent tooth bridge is used to replace one or more missing teeth in your mouth. Tooth bridges are fixed, in that they are cemented on the supporting teeth, or in some cases fixed on the dental implant that has been placed next to the missing teeth. On your second visit, Palm Bay dentist Dr. Quadri will remove your temporary bridge and the new permanent tooth bridge will be checked and adjusted as necessary, to make sure you have a proper fit. 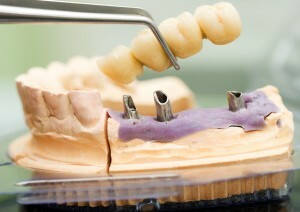 Succeeding visits may be required to check the fit of the metal framework and bite. For a permanent tooth bridge, Dr. Quadri may temporarily cement it in place for a couple of weeks to make sure it is fitting properly. After a couple weeks, the bridge is permanently cemented into place and you will have your signature smile restored. Call our Palm Bay General Dentistry today at 321-312-3040.